Shopping for Star Wars Shot Glasses? Star Wars is an epic space opera franchise conceived by George Lucas. The first film in the franchise was originally released on May 25, 1977, by 20th Century Fox, and became a worldwide pop culture phenomenon, spawning two immediate sequels, released at three-year intervals. Sixteen years after the release of the trilogy's final film, the first in a new prequel trilogy of films was released, again released at three-year intervals, with the final film released on May 19, 2005. 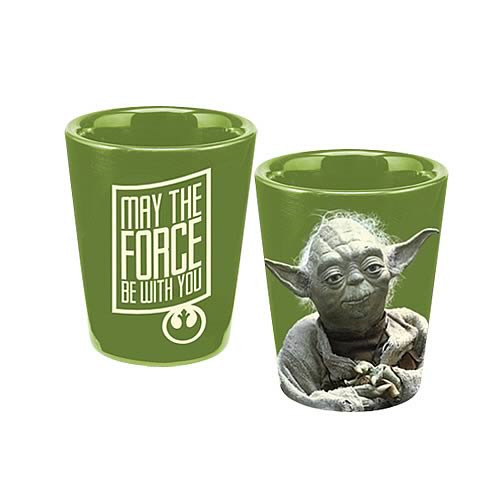 This Yoda "May The Force Be With You" ceramic shot glass features distinct design on front and back. Dishwasher safe. Measures 2 1/2-inches tall x 2-inches round. Order yours today!